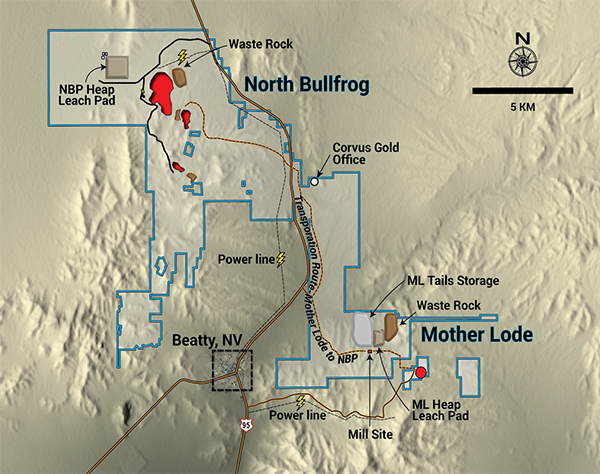 Vancouver, B.C… Corvus Gold Inc. (“Corvus” or the “Company”) – (TSX: KOR, OTCQX: CORVF) announces results for its initial Preliminary Economic Assessment (“PEA”) combining the North Bullfrog-Mother Lode projects in southwest Nevada (Figure 1). Results outline a large new Nevada mining project with attractive preliminary production statistics that include estimated 347,100 ounces of annual gold production during the first four years and an after-tax 5% discounted Net Present Value (“NPV”) of USD $586M with an IRR of 38% and estimated payback period of 2.1 years (Table 1, 2, 4 & 5). Expanding the higher grade, mineral resource base at both the Mother Lode and North Bullfrog projects with continued mineral resource expansion drilling, including new deep targeting of high-grade feeder zones. Ongoing results from the Mother Lode indicate the deposit has the potential to grow and expand beyond its existing mineral resource, in particular mineralization is thickening to the north (current northern most hole, ML18-083 with 65.5m @ 1.53 g/t Au reported NR18-17, October 17, 2018,). Corvus controls 100% of its North Bullfrog Project, which covers approximately 86.6 km2in southern Nevada. The property package is made up of a number of private mineral leases of patented federal mining claims and 1,057 federal unpatented mining claims. The project has excellent infrastructure, being adjacent to a major highway and power corridor as well as a large water right. The Company also controls 445 federal unpatented mining claims on the Mother Lode project which totals approximately 36.5 km2 which it owns 100%. 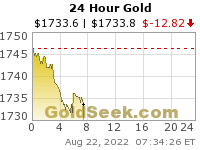 The total Corvus Gold 100% land ownership now covers over 123.1 km2, hosting two major new Nevada gold discoveries. This news release contains forward-looking statements and forward-looking information (collectively, “forward-looking statements”) within the meaning of applicable Canadian and US securities legislation. All statements, other than statements of historical fact, included herein including, without limitation, statements regarding the economics and project parameters presented in the PEA, including, without limitation, IRR, all-in sustaining capital costs, NPV and other costs and economic information, possible events, conditions or financial performance that is based on assumptions about future economic conditions and courses of action; potential expansion of the deposit; the rapid and effective capture of the potential of our Mother Lode project; the potential for new deposits and expected increases in the system’s potential; anticipated content, commencement and cost of exploration programs; anticipated exploration program results and expansion of existing programs; the discovery and delineation of mineral deposits/resources/reserves; the potential to discover additional high grade veins or additional deposits; the growth potential of the Mother Lode project; and the potential for any mining or production at the Mother Lode project, are forward-looking statements. Information concerning mineral resource estimates may be deemed to be forward-looking statements in that it reflects a prediction of the mineralization that would be encountered if a mineral deposit were developed and mined. Although the Company believes that such statements are reasonable, it can give no assurance that such expectations will prove to be correct. Forward-looking statements are typically identified by words such as: believe, expect, anticipate, intend, estimate, postulate and similar expressions, or are those, which, by their nature, refer to future events. The Company cautions investors that any forward-looking statements by the Company are not guarantees of future results or performance, and that actual results may differ materially from those in forward looking statements as a result of various factors, including, but not limited to, variations in the nature, quality and quantity of any mineral deposits that may be located, variations in the market price of any mineral products the Company may produce or plan to produce, the Company’s inability to obtain any necessary permits, consents or authorizations required for its activities, the Company’s inability to produce minerals from its properties successfully or profitably, to continue its projected growth, to raise the necessary capital or to be fully able to implement its business strategies, and other risks and uncertainties disclosed in the Company’s 2017 Annual Information Form and latest interim Management Discussion and Analysis filed with certain securities commissions in Canada and the Company’s most recent filings with the United States Securities and Exchange Commission (the “SEC”). The Company does not undertake to update any forward-looking statements, except in accordance with applicable securities laws. All of the Company’s Canadian public disclosure filings in Canada may be accessed via www.sedar.com and filings with the SEC may be accessed via www.sec.gov and readers are urged to review these materials, including the technical reports filed with respect to the Company’s mineral properties.